During pregnancy you may notice a variety of changes to your skin. Some people may comment on the sudden glow on your face, a positive transformation reflecting your inner joy. Other changes, such as stretch marks, acne and varicose veins, represent the unwanted effects of pregnancy. As you progress through your pregnancy, you may see discoloration, similar to a bruise, on your abdomen near or around your belly button. In most cases the bruising is not cause for alarm, but bring it to the attention of your doctor to be sure. A bruise, also called a contusion, forms when your skin sustains an injury. When you bump your soft tissue, the tiny blood vessels under the skin break, allowing red blood cells to leak out of the blood vessels and accumulate under the skin, causing a mark that appears blue, purple, red or black. As your belly grows to accommodate the growing fetus, your skin stretches and those with a belly button classified as an "inny" notice a new protrusion. In these cases, because the skin of your belly button has been protected, it is sensitive. Simple things such as rubbing on clothing can irritate the belly button and cause a bruise. Other discolorations on or near the belly button may look like a bruise but actually be something different. During your second trimester, in the fourth or fifth month, you may notice the appearance of a dark line that runs from your belly button to your pubic area. This line, known as the linea nigra, is present in everyone but usually stays a light color and remains unnoticed. Pregnancy triggers an increased production of certain hormones, causing a hormone imbalance, which can cause the linea nigra to darken. The linea nigra may appear as a bruise on and around your belly button, but, upon closer inspection, you will notice it continuing vertically down your abdomen. 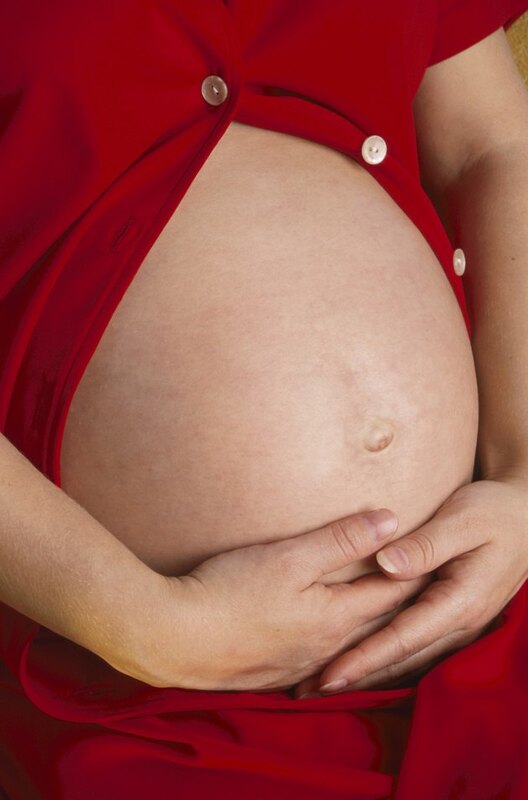 Pregnancy can cause an abdominal muscle separation, medically known as diastasis recti. An abdominal wall separation occurs when pressure on your abdominal wall causes so much tension, the right and left side of the abdominis muscle separate. You may feel a stretching or splitting sensation and notice slight bruising in the abdominal region, especially around the belly button. If the diastasis recti occurs in the early months of your pregnancy, you may see a gap. During the later months of your pregnancy, it appears as a bulge. An umbilical hernia occurs when part of your intestines protrude through the abdominal muscle and make your belly button protrude. Although most common among infants, umbilical hernias can occur in pregnant women when the pressure of the pregnancy adds too much strain on the abdominal muscle. The protrusion caused by an umbilical hernia can accentuate the discoloration caused by a linea nigra and make it look like a bruise on the belly button. KidsHealth: What is a Bruise?